The Austrian Mint produces one of the most sought-after annual bullion coin programs in the form of the Austrian Philharmonic Series. The coins in this collection include the Gold Philharmonic (1989), Silver Philharmonic (2008), and Platinum Philharmonic (2016). 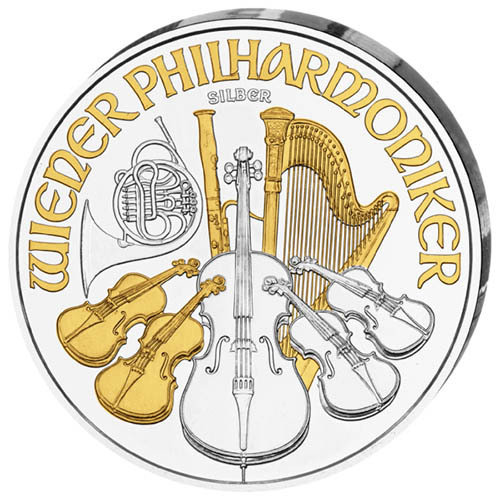 The 2019 1 oz Silver Austrian Philharmonic Coin is available to you for purchase here today at Silver.com with a gilded addition. 12th year of availability for Silver Philharmonic coins! 24-karat gold layer applied on the reverse! Issued a face value of €1.50 (Euros) by Austria. On the obverse is the Golden Hall’s Great Organ. The reverse features a collection of musical instruments. Introduced in 2008 by the Austrian Mint, it only took the Silver Philharmonic Coin five years to become the best-selling coin in continental Europe. During its first five years of availability, some 54 million coins were sold in the Silver Philharmonic Series. That’s an impressive feat for a coin series with just a 1 oz silver bullion coin to purchase. The Silver Philharmonic coin shares the same designs as the Gold and Platinum Philharmonic coins. Thomas Pesendorfer, Chief Engraver at the Austrian Mint, developed the designs in 1989 for the debut of the gold coins in honor of the Vienna Philharmonic Orchestra, one of Austria’s greatest cultural treasures. On the reverse of 2019 1 oz Silver Austrian Philharmonic Coins is the image of nine musical instruments in total. The collection centers on a cello flanked by four violins, with a harp, bassoon, and French horn in the background. Two of the violins on the left, the harp, and the bassoon all have the added layer of 24-karat gold on the surface area. The application of gilded layers does not alter the precious metal value of the coins. It is such a minimal amount of 24-karat gold applied that the coin does not enjoy greater value just based on its precious metal content, but rather as a result of its enhanced visual beauty. 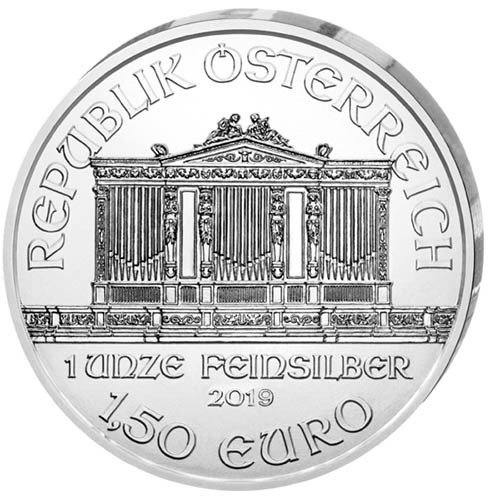 The obverse of 2019 1 oz Silver Austrian Philharmonic Coins includes the image of the Great Organ from within the Musikverein Golden Hall in Innere Stadt. A neighborhood of Vienna, the area is home to the orchestra hall in which the Vienna Philharmonic Orchestra performs most frequently. The orchestra was formally founded in 1843, but orchestral performances began on a regular basis in the city a decade earlier. These 2019 1 oz Silver Austrian Philharmonic Gilded Coins are available to you in Brilliant Uncirculated condition with a protective plastic capsule to keep them safe. We encourage Silver.com customers to call us at 888-989-7223. You can also connect with us online through our live chat and email address features.